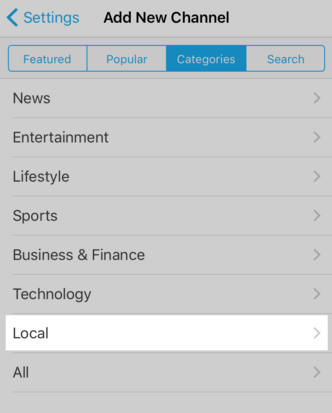 SmartNews Local: More to Love | SmartNews, Inc.
We’ve launched another batch of SmartNews Local channels! For folks who live in or near San Antonio, Orlando, Sacramento, Cincinnati, Cleveland (you lucked out this time, Ohioans! ), and Kansas City — or people who just want to follow news there — you can now find and add your city’s channel by heading to the Channel Plus directory. Just scroll all the way to the “+” tab on the far right of your screen, tap the “Categories” folder, and browse through what’s available under “Local”. SmartNews already offers a wide range of channels, from established publishers with decades of journalistic experience to web-native sources that have bubbled up alongside social media. And we’re always adding more. We want to you to be able to find all the latest trending news in one place, from the hottest political controversy to your favorite sports team’s most recent victory. 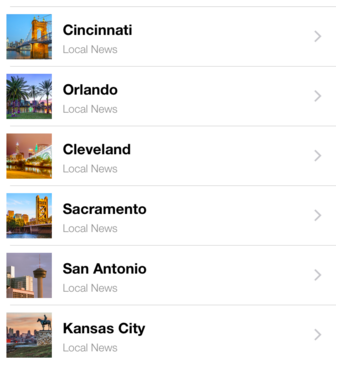 The new channels bring to 29 the number of cities in SmartNews Local. Our super-smart algorithms pull together the most important, most-shared stories from all of your favorite local news sources, so you don’t have to do the work! You can see restaurant reviews, local sports and crime reports side-by-side, instead of having to scour individual websites or wade through your social feeds. If you’re a born-and-bred local, what better way to stay connected to what’s happening in your neck of the woods? If you’re new to a city or a frequent traveller, SmartNews Local will take the puzzle out of exploring your new surroundings. You might even discover that one hidden gem of a story that others missed. I’ve already added three local channels: San Francisco, where I live; Boston, to keep tabs on the weather so I can send taunting snaps of myself to my sister as she trudges to class through a foot of snow; and Orlando, which I’m using to plan my next vacation by taking advantage of SmartNews’s integration with Pocket to save links for later use! Bonus Tip of The Day: If you want to see your local channel as soon as you open SmartNews, hold down any colored channel tab to bring up the “Edit Channel Order” page. Drag the triple-bar icon on the right to put channels in any order you want. Voila! As always, we’d love to hear what you think about SmartNews, so please feel free to reach out to us at support@smartnews.com or via Twitter at @smartnews with any questions or suggestions.